There are few companies which possess the brand recognition that Victorinox does. At one time, they were one of the co-producers of the Swiss Army Knife. In 2005, they purchased their ailing rival, Wenger, and have since consolidated the two brands under one label. 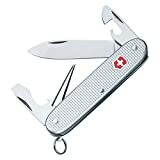 For many, the word “pocketknife” is synonymous with the little red handle and silver cross of the Swiss Army Knife (or SAK). Much like traditional folders, these multitools possess a certain charm that declassifies them as weapons in the mind of the general public. Most people are familiar with the plastic handled models: they are cheaper, and more widely available in “big box” stores such as Walmart and Target. 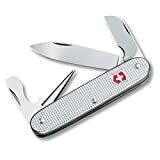 Although offerings such as the Classic and the Spartan are ubiquitous, they aren’t the best that Victorinox has to offer. In my opinion, that title is reserved for the Alox line of multitools. “Alox” SAK’s were first introduced in 1957 and represented a fundamental shift away from the original design of the Swiss Army Knife. This variant – the Pioneer – featured aluminum handles, a cigar shaped handle, and a bottle opener in addition to the main blade, awl, and can opener. It was originally intended for civilian markets, but a reputation for sturdiness prompted the Swiss armed forces to adopt it. The Soldier (a cosmetically modified Pioneer) was issued to Swiss troops from 1962 until 2008, when it was replaced by the Soldier 08. Fortunately, Victorinox still produces the Alox line, though it hasn’t been updated in quite some time. Today I’ll be looking at two very similar models in the 93mm family of tools: the Pioneer and the Electrician. Each model features four identical tools: a main blade, a combination flathead screwdriver/bottle opener, and an awl. The Pioneer has a can opener (with a smaller flathead driver on the tip), whereas the Electrician has a 1.6” long sheepsfoot blade. Both have a closed length of 3.7”, a blade length of 2.8”, and an overall length that’s just under 6.5”. Finally, each of them weighs around 2.5 oz. All of these numbers are pretty comparable to similarly sized traditional knives. That’s quite an impressive feat, considering the number of tools Victorinox managed to fit onto these things. I’ll be the first to admit that 99% of the time I’m just using the main blade or the bottle opener, but the other tools are well designed and occasionally save the day. Ironically, I’ve found that having the odd tool like a can opener, a corkscrew, or an awl only becomes more important as companies move towards “tear along the dotted line” style packaging. Society is becoming used to not needing these small, handy tools. As a result, that can opener might not be in the kitchen drawer when you need it to be. Sure, you might look insufferably handy whipping out your Swiss Army Knife, but you’ll save someone a trip to the nearest store by doing so. The materials here are fine, even in comparison to modern “tactical” folders. While the edge does need to be regularly maintained, it can be done just about anywhere. I’ve used the bottom of a coffee cup as a stone and a bit of cardboard (no compound) as a strop on more than one occasion, and the results aren’t much worse than what I get from my stones and strop at home. This steel’s corrosion resistance is quite impressive—so much so that I’ve put my Cadet away wet without consequence. Chipping has never been an issue. All the tools fit neatly inside the aluminum frame without rubbing against each other or the scales, and crisply snap open and closed. It should be noted that Alox models do not have rear mounted tools; as a result of this, the backspring runs the entire length of the spine. As a result, the pull is much stronger. Of course, the real differentiating mark between the Alox and the normal models are the ribbed aluminum handle scales. They’re slimmer, more durable, offer a better grip, and in my opinion are much more attractive. The anodization on every model I’ve handled has been quite good, though fairly prone to wear. On the silver models the wear is barely discernable, but with other colors you’ll see fading occur within hours of exposure to your keys. None of this impacts the stellar grip. With a classic cigar shaped handle, gentle texturing, and slight chamfering, both the Pioneer and the Electrician are very comfortable in the hand. The keyring on the Pioneer is occasionally pokey, but less so than a pocket clip would be. On paper, the 93mm knives should be great pocket companions. About a month of experience has poked some holes in that assumption. By no means are they awful, but carrying either of these knives is occasionally awkward. Both the Pioneer and the Electrician are just a bit too tall for the front and watch pockets of most jeans (though they’ll fit into the extra-large watch pocket of my work jeans). Additionally, while the handles are great in terms of grip and aesthetics, they’re pretty slick in the pocket. My first Alox Cadet disappeared on me, and I can only assume that it slid out of my pocket one day as I was lying down. Both models will fit inside a KnivesShipFree Main Street slipcase, which is a great way to distribute the odd dimensions in a bit more comfortable fashion. If that’s not up your alley, the Pioneer has a keyring that you can attach a lanyard to. Personally, it’s hard to find something new to say about a pair of tools that are fairly well-known among gear aficionados. Neither is as svelte as the Cadet, but they offer longer blades, a more outdoor oriented set of tools, and a better grip. They’re a bit too large to play the role of a back-up knife, but make for a fine primary tool (especially around folks who get fidgety around modern knives). The handles are so classy that either of these could serve as a dress knife, yet the tools are rugged enough for just about any “prepper” scenario. If I had to pick one of them, I’d pick the Electrician. I rarely use the keyring on the Pioneer, and the funky secondary blade on the Electrician is great for opening packages without worrying about damaging the contents. Both are tools that I’d recommend to anyone, especially at the $30 price point you can find them at. If you would like to buy a Pioneer or Electrician, I recommend purchasing them at Amazon. Please consider that buying anything through any of the links on this website helps support BladeReviews.com, and keeps the site going. As always, any and all support is greatly appreciated. Thank you very much. I own both (as well as a Cadet and a Farmer) and I too prefer the Electrician – the utility blade is more useful than the can opener. Of them all I carry the Cadet the most due to its size. I really wish Victorinox would update the line with a few more Alox offerings. I’d love a model with blade, scissors and combo tool. Thanks, Larry. I have a Pioneer personally, and I like the Electrician more – that little sheepsfoot blade is cool. A Cadet or Pioneer with scissors would be cool for sure. Thanks for the comment! It’s always seemed to me that Victorinox was leaving money on the table by not producing more Alox tools. There is a small number of folks who modify these tools (Robert Lessard AKA SAKmodder is a good one). I’d take a look into that if you have the cash to spare. Yeah, they’re not glamorous or especially “cool” but you can’t beat the trusty SAK for all-around utility. I’ve had the model with the phillips head attachment (can’t recall the name) on my keys for ten years or so, built like a rock and gets the job done. I agree, Earl. The the utility of these little SAKs is undeniable. Thanks for stopping by.